Phil Goodstein, How the West Side Won: The History of West Denver/Auraria. Denver: New Social Publications, 2015. ISBN 0–9860748–1–0. vi + 474 pp. Illustrations. index. $24.95. The Auraria Higher Education Center is far and away Denver’s largest campus and a major center of life, employment, and scholarship. It occupies what was the first permanent white settlement in the area during the Pikes Peak Gold Rush in 1858. The evolution of the land is very much the history of Denver as a whole. 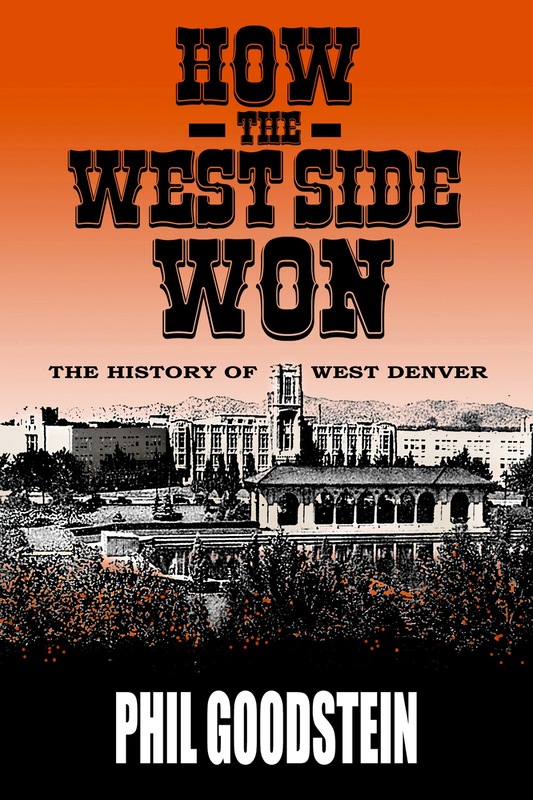 Such is the message of a vibrant, well-illustrated new volume, How the West Side Won: The History of West Denver/Auraria by acclaimed Denver historian Phil Goodstein. Focusing on the triangular area encompassed by Cherry Creek, the South Platte River, and West Sixth Avenue, it concentrates on the people, the places, institutions, and industries that have shaped the Mile High City. Early on, Auraria sought to be the central trading community of the Rocky Mountain West. An 1864 flood on Cherry Creek washed away many of its hopes. By this time, it was West Denver. A merger between Auraria, Highland, and Denver City in 1859 defined all the land to the southwest of Cherry Creek as West Denver. As Denver’s population soared from about 6,000 settlers in 1870 to 134,000 residents in 1900, residences and businesses filled the West Side. Dwellings ranged from ornate Victorian manors to incredibly slipshod structures. A wide variety of churches arose in the neighborhood. Early on, residents took great pride in distinguished schools. Lincoln Park emerged in 1885 near West 12th Avenue and Mariposa Street. Among the first parks in the city, in the early 20th century it became the home of an inaugural municipal bathhouse/swimming pool. Then, around the time of World War II, the city’s first housing project went up north of it near West 14th Avenue and Mariposa Street. By that time, the County Jail had long been at West 14th Avenue and Kalamath Street, adjacent to the West Side Courthouse at West Colfax Avenue and Kalamath Street, the site of the city’s criminal trials. A mile away was Denver General Hospital, the forerunner of Denver Health Medical Center. Those wanting a distinctive meal went to the city’s oldest restaurant, the Buckhorn Exchange at West 10th Avenue and Osage Street. People dwelling in West Denver had a fierce pride in their neighborhood. Many were proud Cowboys, graduates from West High. The latter created its alumni association in 1886, two years after its inaugural graduation. All the while, residents came and went from the area. Especially by the 1960s, the West Side had a large Hispanic population. During the next decade, it was the exemplar of the Great Society in Denver. From the beginning, Santa Fe Drive has been West Denver’s Main Street. Once a trail ultimately connecting with Santa Fe, New Mexico, it has evolved from being a residential address to a center of middle-class retail to the city’s premier art district. How this has happened, the interaction between residents and city hall, and the drama and pathos of everyday neighborhood life are central themes of How the West Side Won. Author Phil Goodstein is a Denver native. His family was in Auraria at the turn of the 20th century. Though growing up in Park Hill and long dwelling on Capitol Hill, he has been in and out of West Denver since the 1970s. He has written more than 20 books on the Mile High City, arguing that an appreciation of the past is crucial for an understanding of the present. How the West Side Won is his latest contribution to the many people and forces who have made Denver what it is.